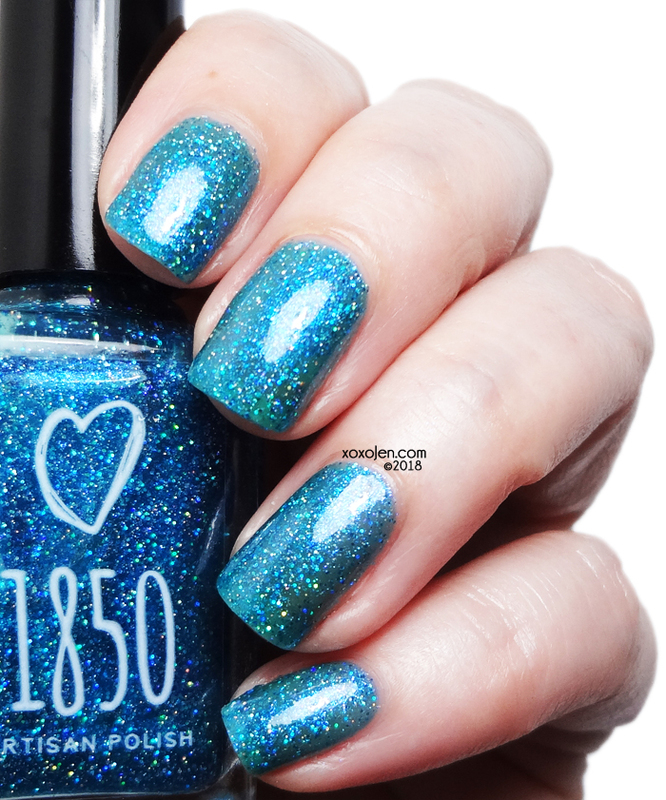 Available on the 1850 Artisan Polish website on May 19th. 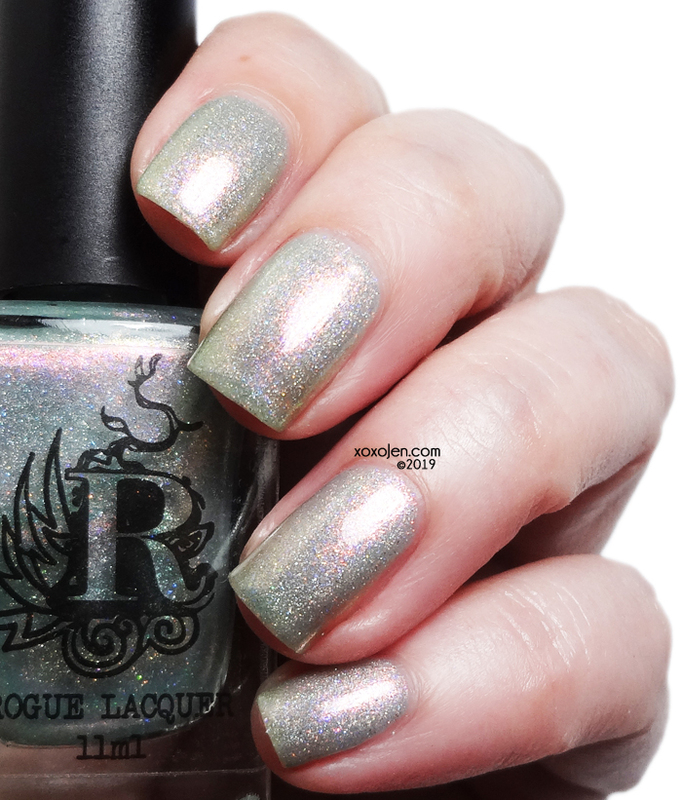 Each polish has a squishy jelly formula that is smooth to the touch. 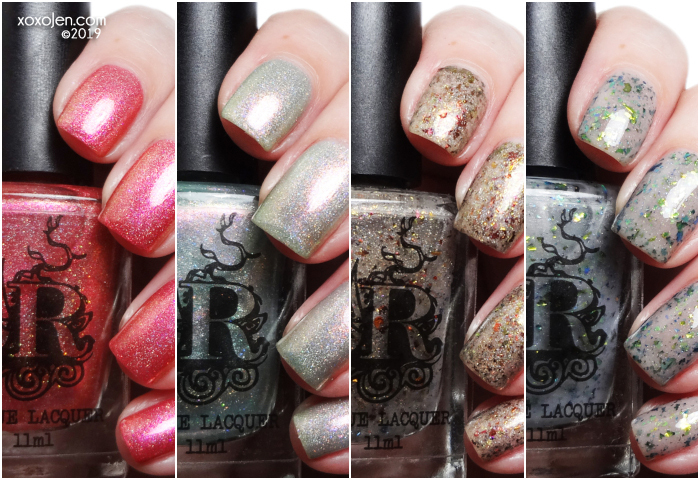 I've worn two coats with topcoat for each photo. 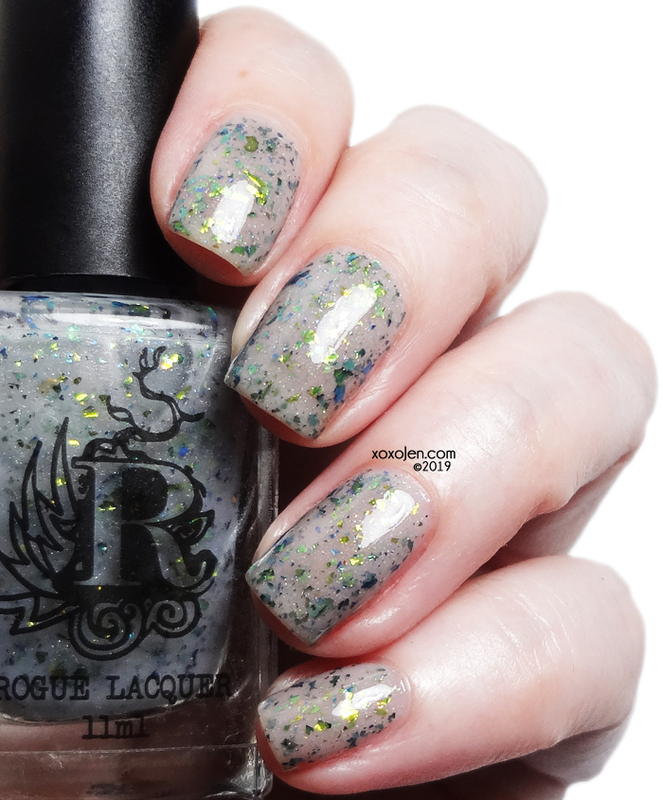 This turquoise jelly is filled with turquoise and silver holographic glitters and a hint of a blue flash. I Am Not A Prize to Be Won is based on the strong and independent Princess Jasmine from Aladdin. 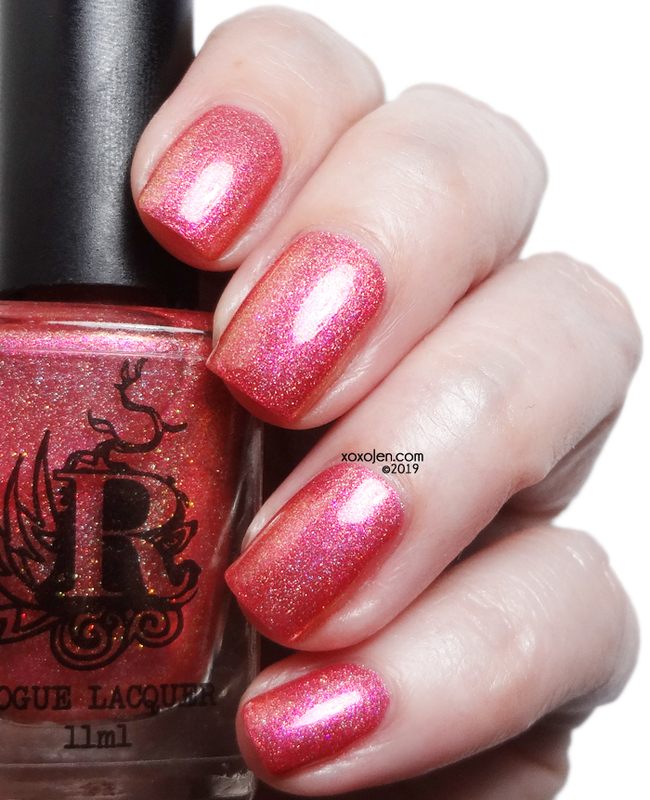 Inspired by Princess Aurora, the sleeping beauty who believed in her true love, this bright pink has a beautiful blue flash and is loaded with fuchsia and silver holographic glitters. 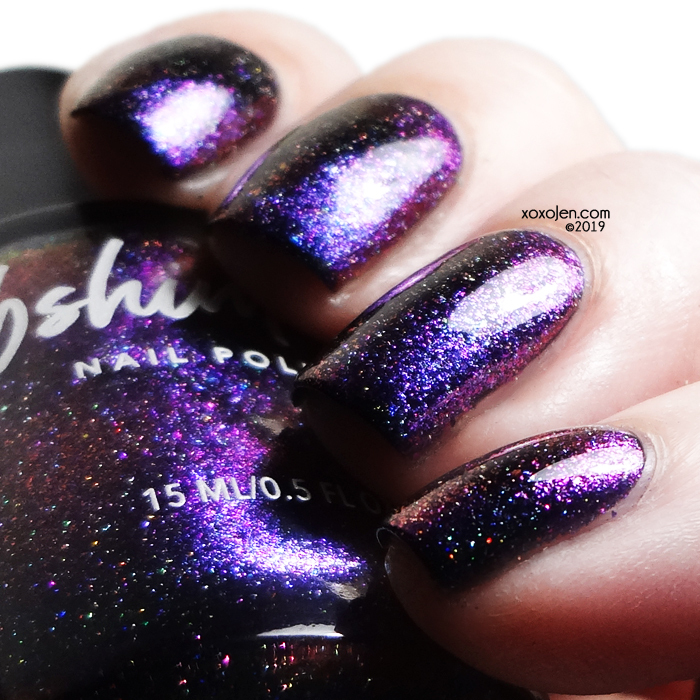 Rapunzel’s purple dress and feisty attitude inspired this beautiful purple glitter polish. 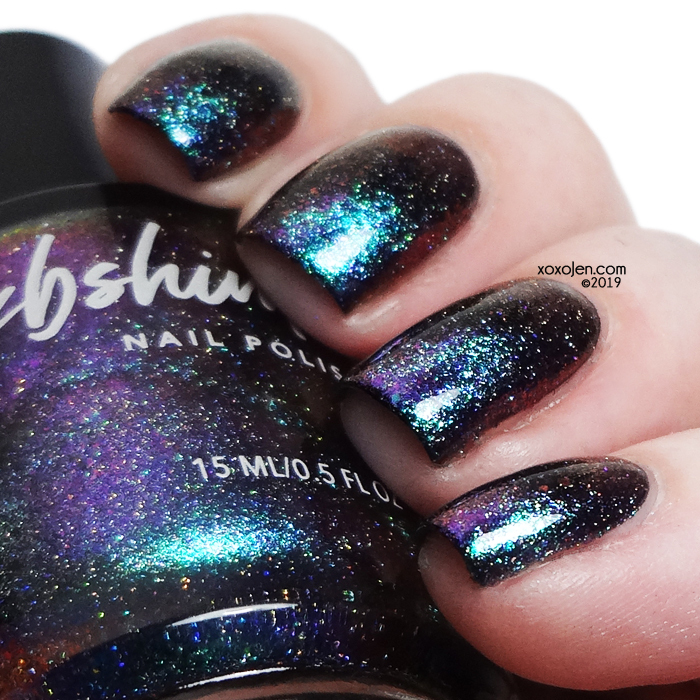 It is a purple jelly base filled with two sizes of purple holographic glitter and silver holographic glitter. 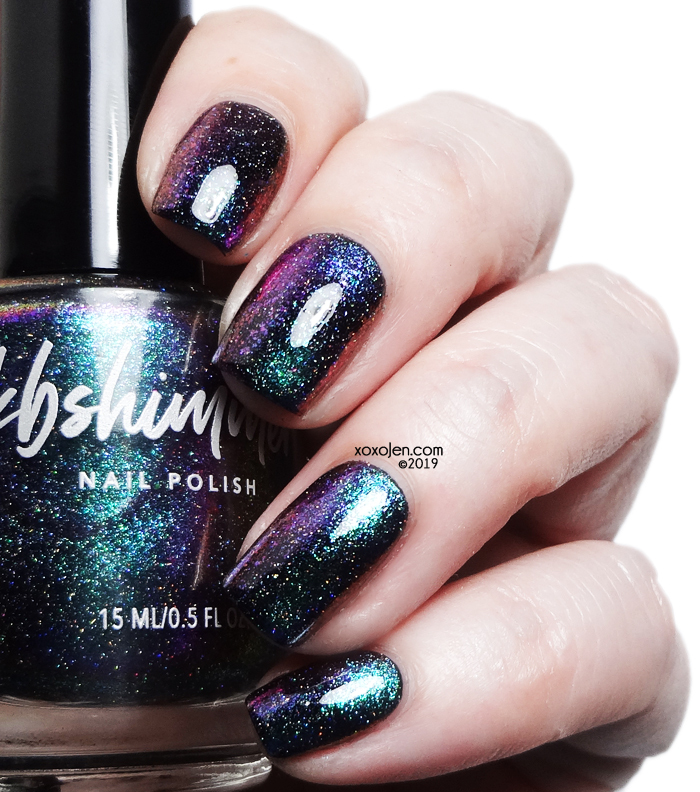 One year ago, KBShimmer took a leap forward and launched a new look to celebrate the anniversary of their 10th year in business! 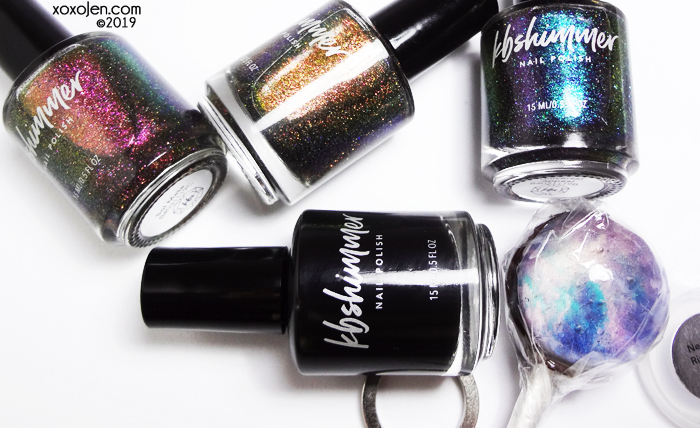 They debuted the new logo and packaging featuring holographic accents by bringing you Launch Party, a beautiful magnetic space-themed collection! 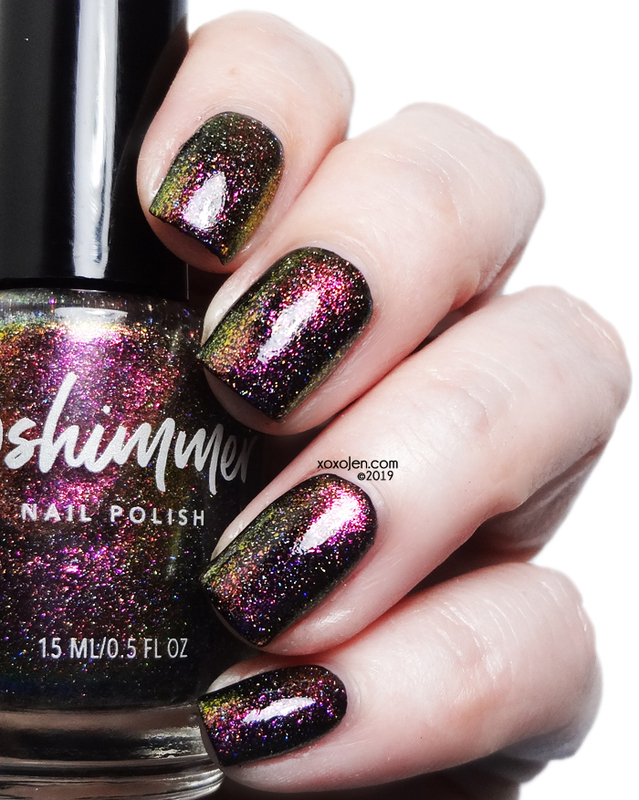 On April 8, we celebrate the one year anniversary of KBShimmer's new look - which we love even more today! 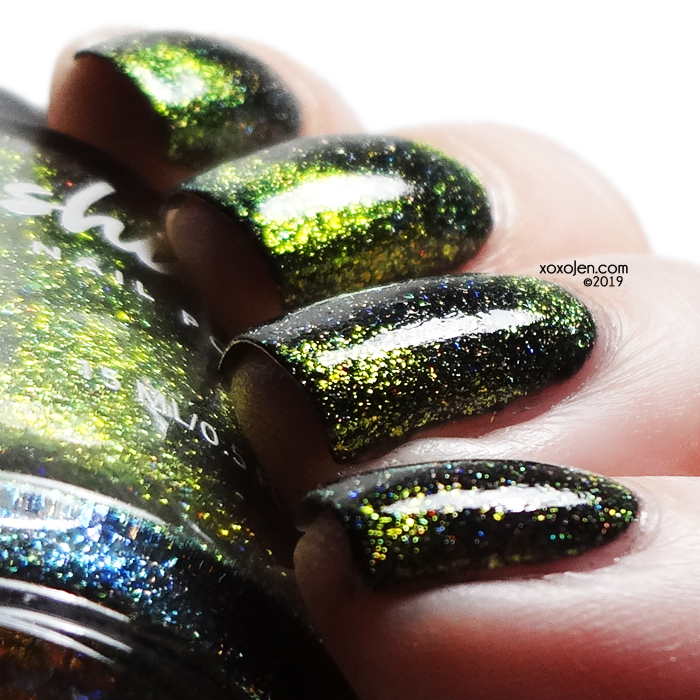 - by bringing you a new magnetic top coat trio! 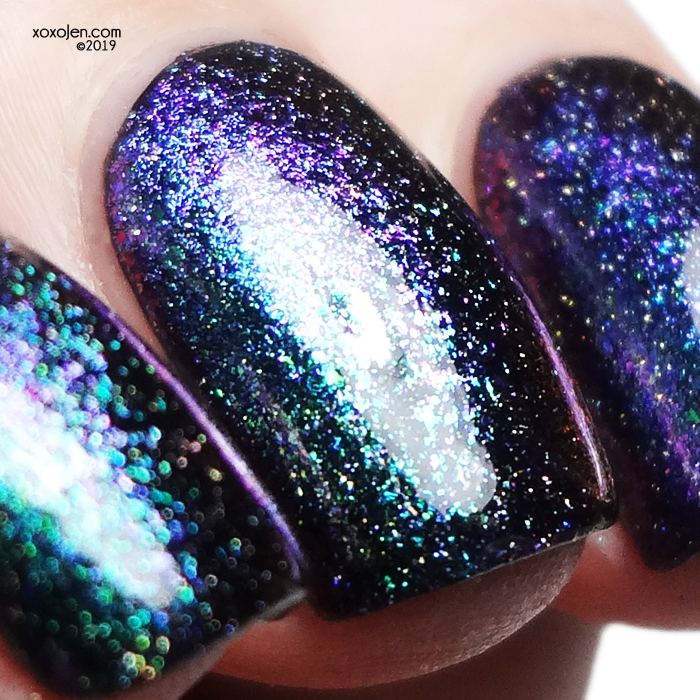 This trio features magnetic multichrome flakes and vibrant micro holo flakes for a celestial look that is out of this world! Deep, dark, nothing. 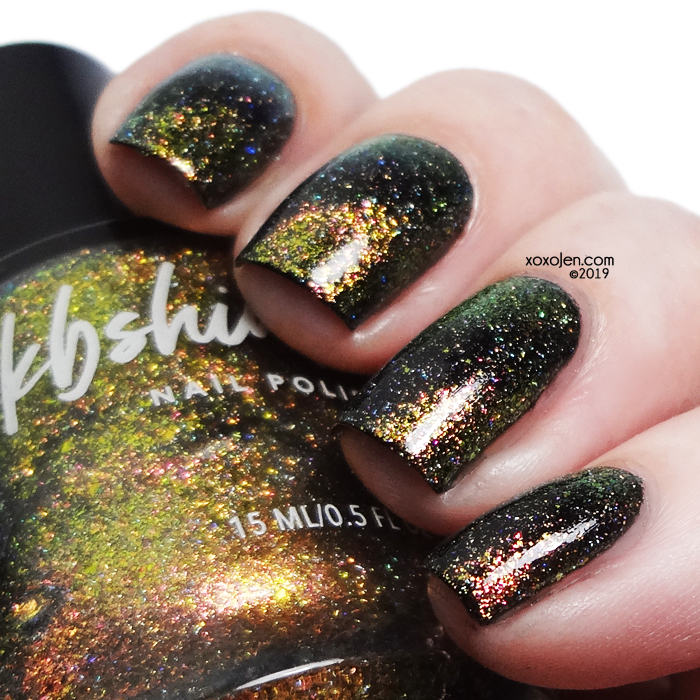 Black is a fashion staple not only in clothes, but also on your nails! This is a true black cream. With careful application, I got opaque coverage in 1 coat. 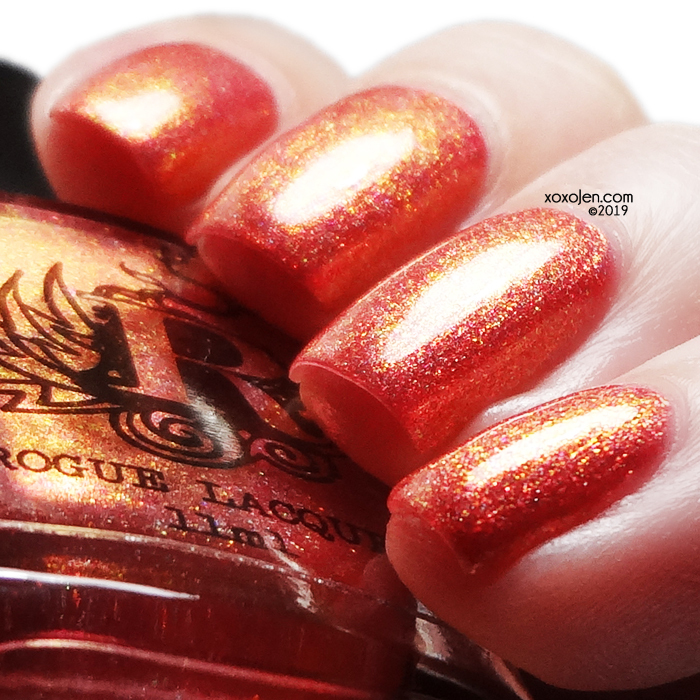 Shown with no topcoat, just one coat of Eclipse. 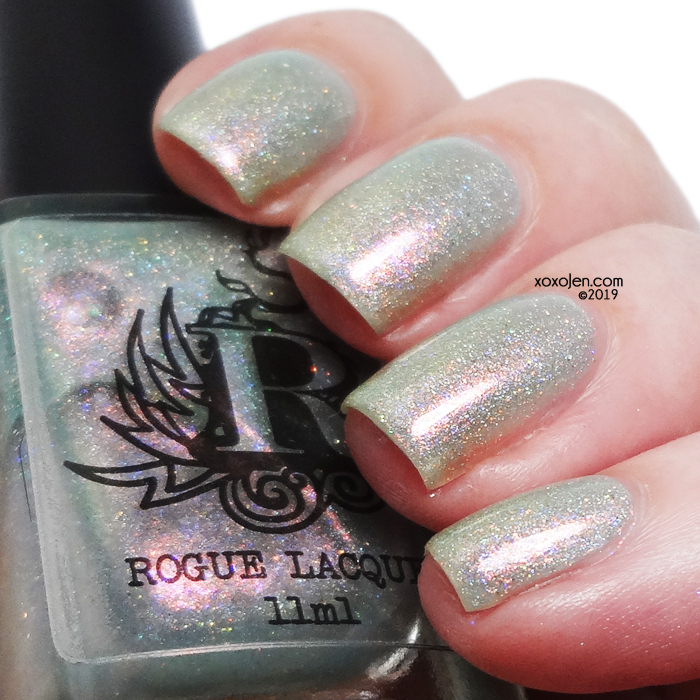 I wore this polish under each of the swatches below. Formula is creamy and smooth. 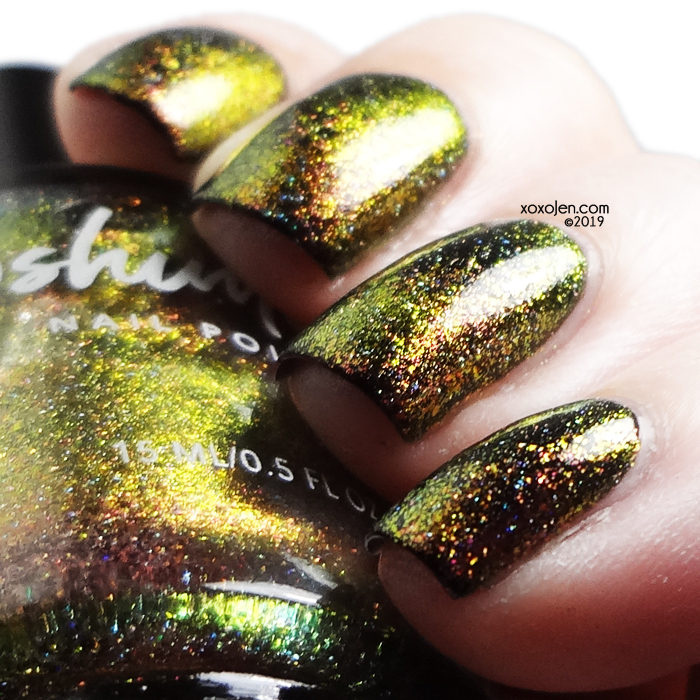 All the magnetics are shown in 1 coat over Eclipse, using the KBShimmer ring magnet, then topcoated. 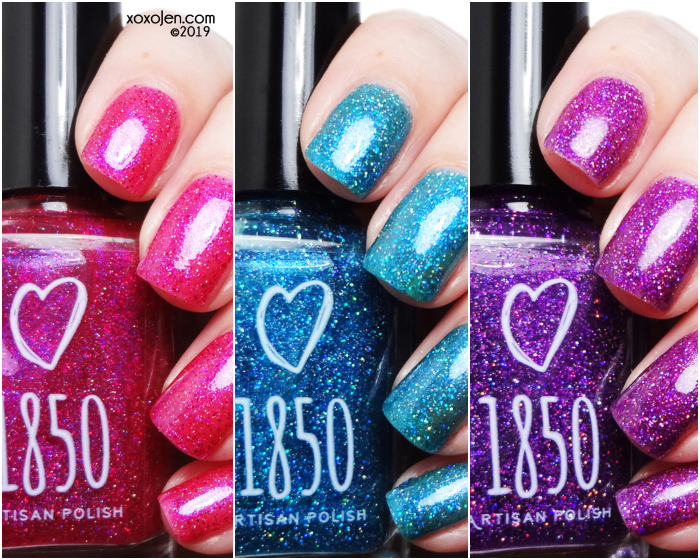 Their formulas are smooth and apply evenly. Galaxies swirl with planets, stars, dust and dark matter. Universal Appeal is a galaxy-inspired shade alive like the Milky Way, with hues of purple and pink that shift into a vibrant emerald green. 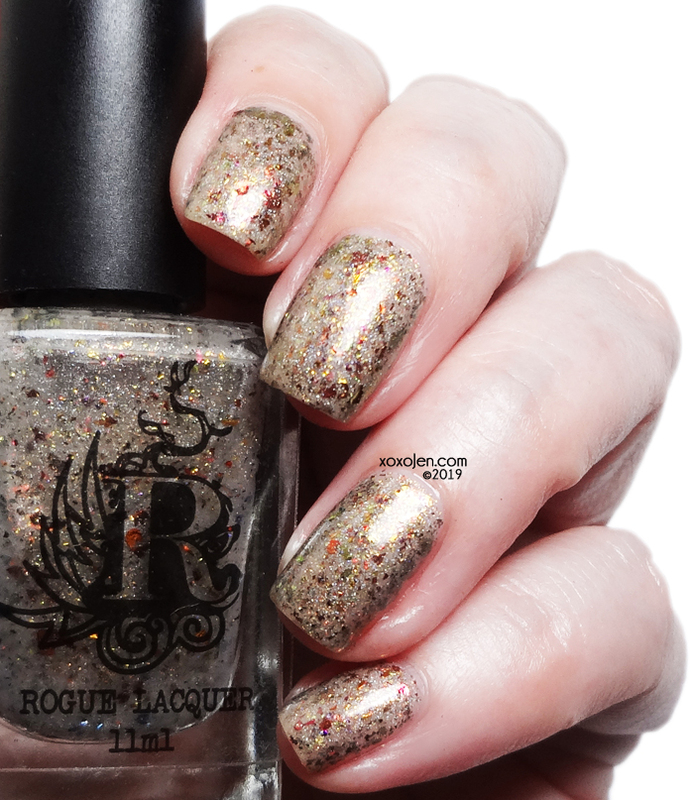 At some angles, hints of golden orange or dusty silver also appear. 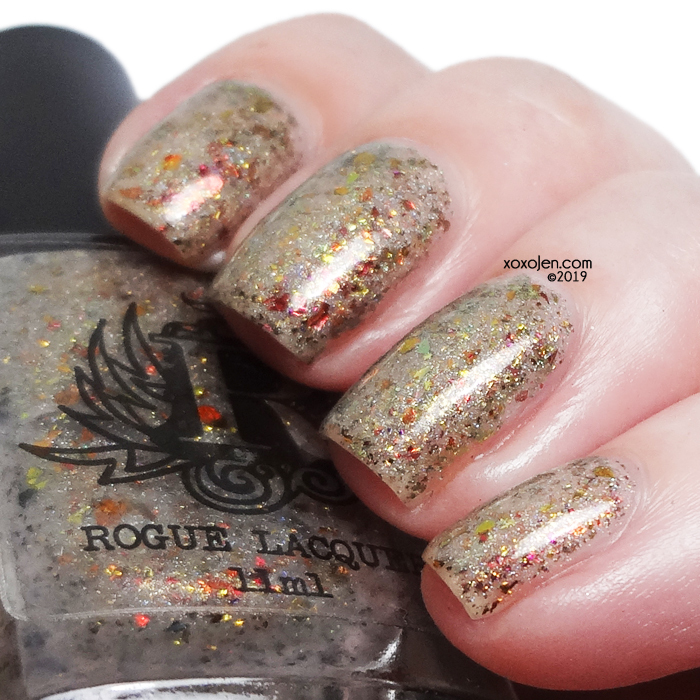 Micro holo flakes add sparkle and shine to this magnetic flake top coat. 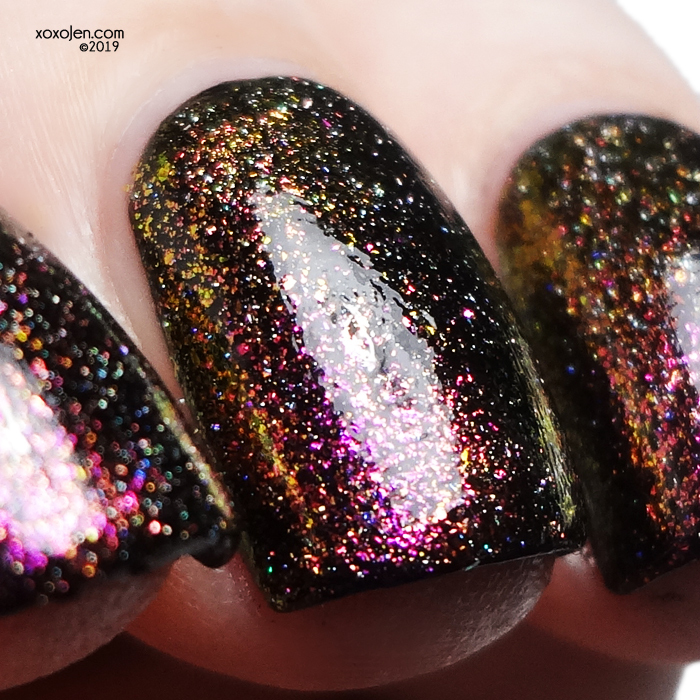 Best worn over black or other dark colors when used with a strong magnet, Universal Appeal can also be worn alone in 2-3 coats when not magnetized for a unique multichrome finish. 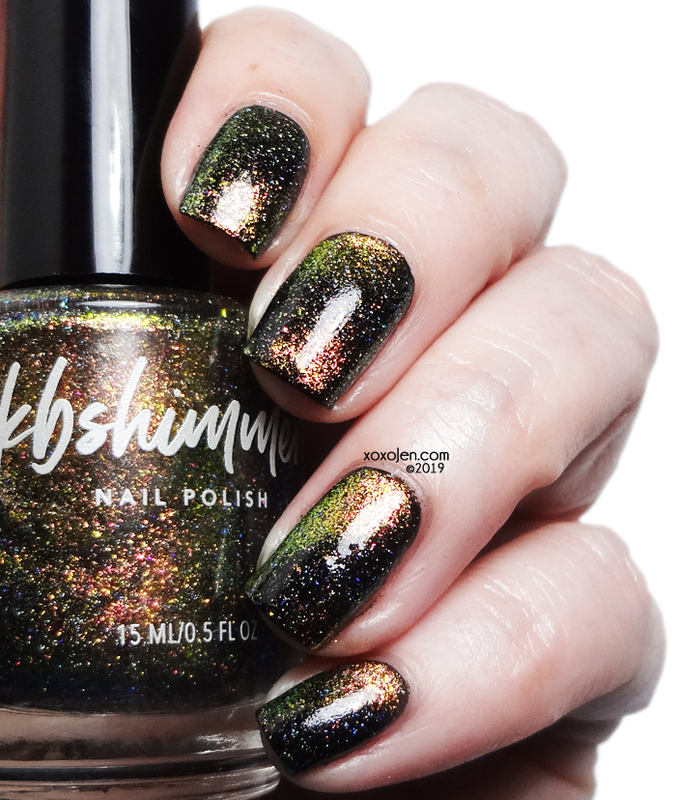 Kbshimmer's Ring Magnet was used with above swatches. Below is Christy's description and her photo. It comes in a perfectly sized plastic case! 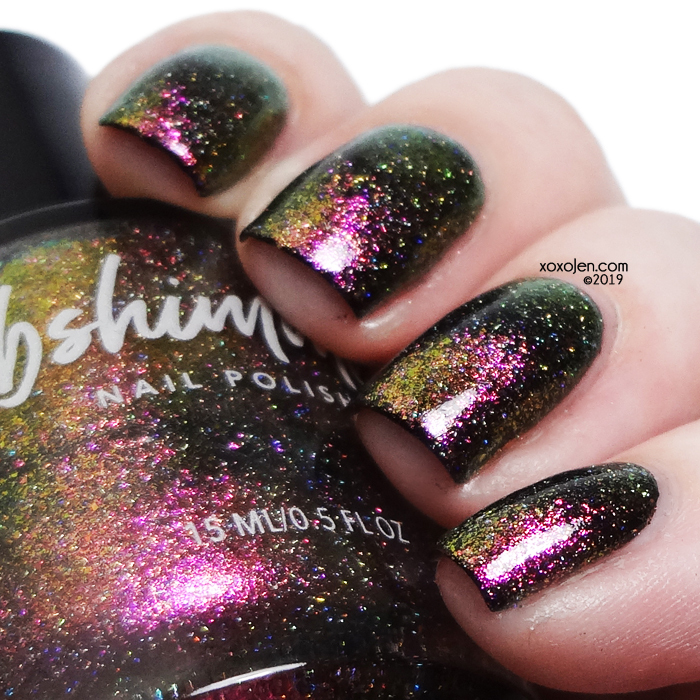 Magnetic polishes are an out-of-this-world invention! 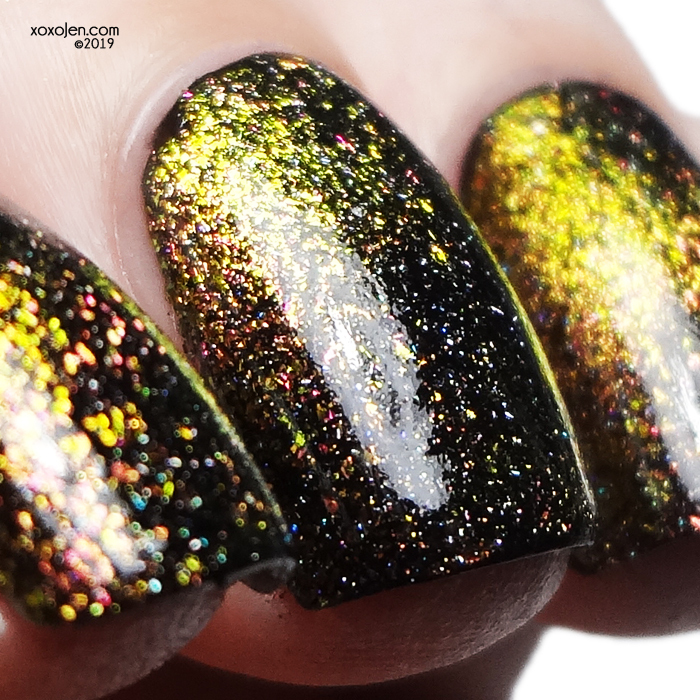 With the power of a magnet, color is shifted and relocated on the nail for a futuristic effect. For best results, you need a strong magnet with the right magnetic pattern – and not all magnets will work. 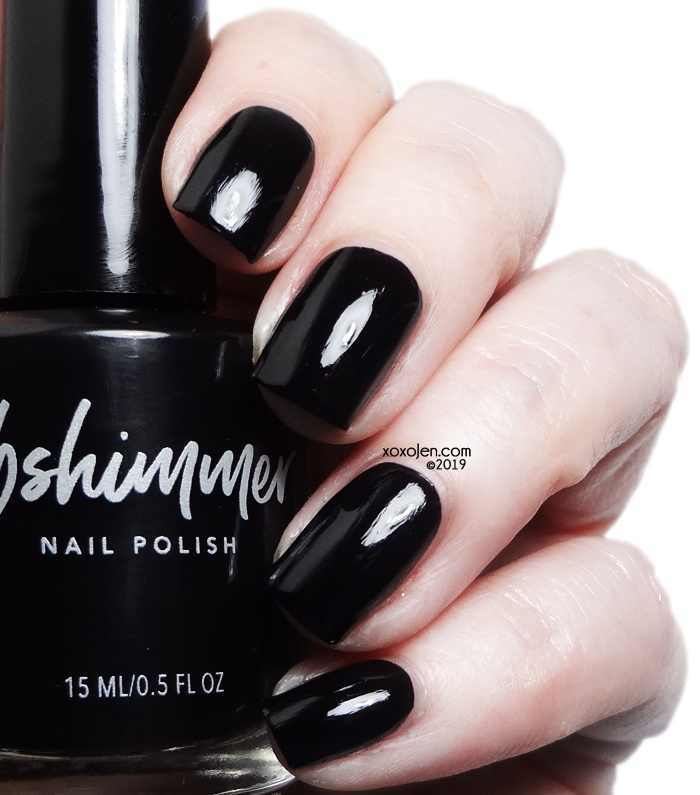 The KBShimmer Neodymium Ring Magnet will give your magnetic polish manicures a makeover! This one-inch magnet has a convenient 3/4-inch opening large enough for most fingers, and is 1/4-inch in width. 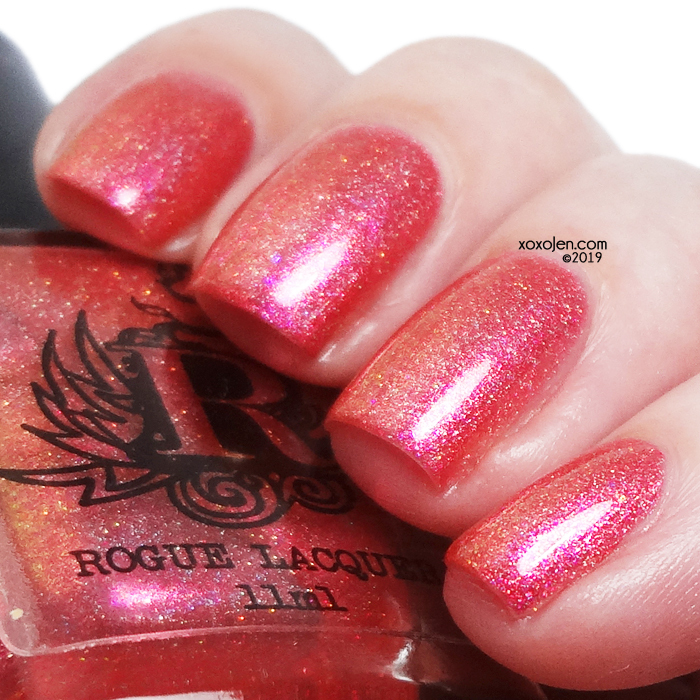 For a curved, negative space on the nail, hold ring flat against nail about 1/4 inch away. For a subtle linear look, hold nail inside the ring. 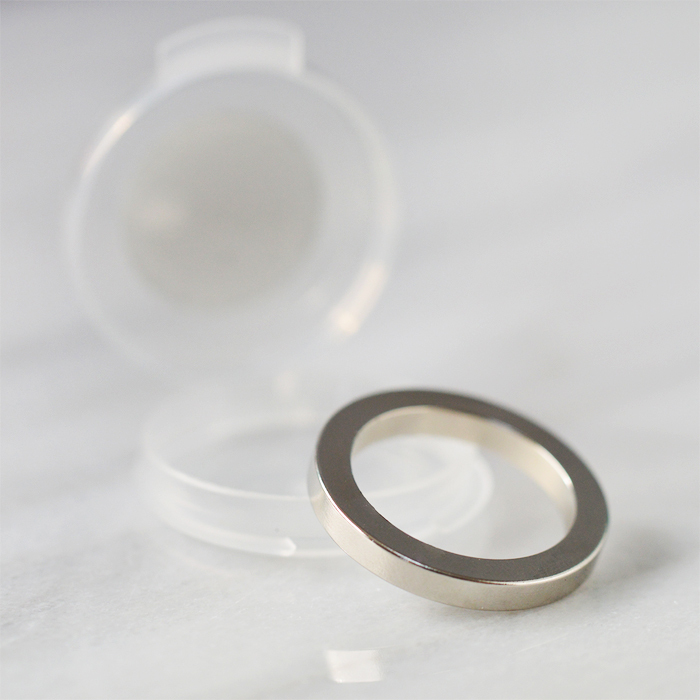 This magnet can be used with all magnetic polishes (including gel varieties).